The adoption of drones in mining is growing rapidly. In September, CMJ headed to the annual InterDrone conference in Las Vegas, speaking with several companies in the drone service and software business, and moderating a panel on the use of drones in mining. Here’s what we found. Since mining and aggregates companies first started to adopt drone technology several years ago, it has saved them time and money while increasing safety. As a result, miners have embraced the technology and are finding more ways to use the. “Three years ago, you could count the number of drones in mines, construction, and quarries on your hands and feet,” said Mike Winn, a cofounder of DroneDeploy. Drones are now firmly entrenched in applications such as volumetrics, mapping, and equipment inspection, CMJ heard at InterDrone. So now that drones are being embraced by the mining sector, what are some of the future trends in the industry? Drones are going in-house Many companies started out intending to sell drone flying services or actual drones to customers, but the dominant companies in the space offer more. They have software that makes stockpile reconciliation, contour mapping, blasting, mine planning and day-to-day operations cheaper and easier to manage. Mining companies have stepped up to buy and fly their own drones, realizing it’s the most practical and cost-effective way to make use of the technology. 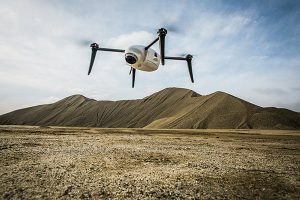 “It’s hard to see this industry scale if people are not buying their own drones,” said Lewis Graham, president and chief technical officer of GeoCue Group. “The way we see it moving forward is more and more mining companies are going to internalize the actual flying. We have customers today that are flying their own drones that two years ago said they would never think about doing this – so we have seen that shift and it’s all about scale,” Graham said. Besides, companies have made the drones and the software that processes droned data, easy to use. With the most popular drone in the industry – the Phantom 4Pro only around US$1,500, there’s no barrier for smaller companies/ operations to make use of the technology. However, most companies still rely on service providers to ensure they’re making the most of the technology. In an industry that’s been focused on productivity, drone data offers new ways to unlock those advances, says Francis Vierboom, co-CEO of Propeller Aero. He notes that while information technology has turned ecommerce, finance, consumer electronics and other industries upside down, there are a lot of things on large work sites in the mining, construction and heavy civil engineering fields that look the same as they did 20 years ago. Although there have been productivity improvements, Vierboom says drone data opens up another level of innovation and productivity gains. Drones are starting to be used to collect data input for automated machine control – for example, to provide a good topographic map to feed data into equipment like autonomous haul trucks. Graham sees this trend as a main driver in the future for the drone business. GeoCue’s Graham says mining New uses continue to evolve clients are always asking about new ways to use drones. Graham adds this trends will spur the development of new sensors that can be flown on drones. While sensors are currently limited, with optical, infrared and basic laser scanners being the main types, Graham sees the development of new sensors that can be flown on drones in the future (for example, vibration or magnetometer). Rice says another evolving area is integration of drone data with other third-party systems that mining companies may use. Bringing the raw data into software you can use to manipulate 3-D data like Vulcan or Surpac will lead to new applications of “A big part of it is just the fact that there’s a new kind of information that is actually going to empower people to do a lot more themselves with this information. And because it’s so visual, it’s easier for work site teams to comprehend and collaborate on. Automation Drones are starting to be used to collect data input for automated machine control – for example, to provide a good topographic map to feed data into equipment like autonomous haul trucks. Graham sees this trend as a main driver in the future for the drone business. New uses continue to evolve GeoCue’s Graham says mining clients are always asking about new ways to use drones. Bringing the raw data into software you can use to manipulate 3-D data like Vulcan or Surpac will lead to new applications of the data. Integrating the data into ERP (enterprise resource planning) systems such as SAP could also lead to new insights, such as in sales forecasting based on inventory. The question of accuracy in aerial mapping is a complex one. A survey can be relatively accurate (the position of one point to another in a map or model) without having a high degree of absolute accuracy (how closely a point on a map or model corresponds with its actual physical coordinates). Using ground control points – markers on the ground that are placed strategically around the mapping area – will increase absolute accuracy, although this level of accuracy isn’t necessary for all applications (such as volumetrics). 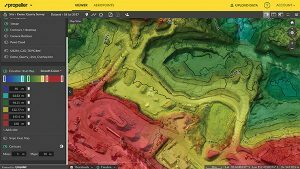 A lot of drone software presents data in a powerful, attractive and easy to grasp visual form. But that doesn’t mean it’s accurate. It can be instructive for companies to experiment with drone technology to understand the value they can get from it and potential pitfalls, says Winn. There are limitations to UAVs in terms of flying time, flying conditions, and the cameras and sensors they can fly. “People always want a drone that flies longer,” said Kespry’s Rice. Lastly, drone data will be another Big Data input that will have future implications for businesses.